Objective To evaluate the effectiveness of a training and support intervention for nursing home staff in reducing the proportion of residents with dementia who are prescribed neuroleptics. Design Cluster randomised controlled trial with blinded assessment of outcome. Setting 12 specialist nursing homes for people with dementia in London, Newcastle, and Oxford. Participants Residents of the 12 nursing homes; numbers varied during the study period. Intervention Training and support intervention delivered to nursing home staff over 10 months, focusing on alternatives to drugs for the management of agitated behaviour in dementia. Main outcome measures Proportion of residents in each home who were prescribed neuroleptics and mean levels of agitated and disruptive behaviour (Cohen-Mansfield agitation inventory) in each home at 12 months. Results At 12 months the proportion of residents taking neuroleptics in the intervention homes (23.0%) was significantly lower than that in the control homes (42.1%): average reduction in neuroleptic use 19.1% (95% confidence interval 0.5% to 37.7%). No significant differences were found in the levels of agitated or disruptive behaviour between intervention and control homes. Conclusions Promotion of person centred care and good practice in the management of patients with dementia with behavioural symptoms provides an effective alternative to neuroleptics. We carried out a cluster randomised controlled trial to determine whether behavioural symptoms in people with severe dementia could be safely managed with an intervention package (focused intervention training and support) to reduce the proportion being treated with neuroleptics. We used a cluster trial design primarily to avoid contamination (because care staff receiving extra training and support could not be expected to treat individual residents differently) but also for practical purposes. The intervention was aimed at changing clinical practice in the nursing home, and hence the home was the unit of randomisation and analysis. We estimated that about 55% of residents would be taking neuroleptics at the start of the trial and that we could reduce this to 30% in the intervention arm by 12 months. For a conventional trial with randomisation of individual patients to be able to detect such a reduction, a minimum of 69 patients would need to be recruited to each arm of the trial (138 patients in total), for a significance level of 5% (two sided), a power of 85%, and equal allocation. As we used cluster randomisation for the purposes of our study, the implications of this are reduced efficiency and loss of power.12 We therefore required a larger sample size to compensate for this design effect (the ratio of the total number of patients required using cluster randomisation to the number required using individual randomisation). The formula 1+[(m - 1)xr1] where r1 = s2b/(s2b+s2w), the intracluster correlation coefficient, is used where s2b is the variance between clusters and s2w is the variance within clusters. Based on the additional assumptions of an estimated intracluster correlation coefficient of 0.05 and an average of 30 eligible and consenting patients in each cluster: 1+(30 − 1)x0.05 = 2.45 we would need 2.45×69 = 170 eligible patients per arm, which is in the order of six clusters (nursing homes) per arm, or 12 clusters in total. We recruited residents within 12 nursing homes, four each in London, Newcastle, and Oxford. Eligible homes were those registered to accept elderly mentally impaired people and with a minimum of 25% of residents with dementia who were taking neuroleptic drugs. The trial's manager enrolled the nursing homes. Consent was obtained from the management of the homes, and the family carers of residents were asked to give consent for involvement of their relatives. Research assistants carried out baseline assessments before randomisation. As neuroleptic prescribing levels varied between the groups, the trial's statistician (blind to the identity of the homes) classified two homes in each region as having low neuroleptic use and two as having high use. The statistician then randomly assigned the homes to intervention or control, stratified by region and baseline neuroleptic use. The allocations were computer generated using stratified block randomisation (fixed block size of two) with Stata version 8. A consultant old age psychiatrist (RH, CB, and RJ) and a senior member of nursing staff from each home reviewed the drug prescriptions of the residents after completion of the baseline assessments but before randomisation. This review followed good practice guidelines6 and included recommending stopping psychotropic drugs that had been prescribed for more than three months and discontinuing the drug when behavioural problems had resolved. The psychiatrists wrote to the prescribing doctors for each home (usually general practitioners) to communicate the recommendation and telephoned if no action had been taken after two weeks. Reviews took place every three months. The psychiatrists were robust in their efforts to reduce psychotropic prescribing. Homes randomised to the intervention arm agreed to the trial's clinician working with them for two days a week for 10 months. Homes randomised to the control arm received treatment as usual. No restrictions were placed on training and supervision activities in any of the homes. Each patient's daily dose of drugs was translated into chlorpromazine daily equivalents according to the British National Formulary. The Cohen-Mansfield agitation inventory20 was used to measure the reported agitated and disruptive behaviours of residents. Dementia care mapping, an observational tool for quality of life research, was used to develop person centred care practice.21 Baseline assessments were carried out by the trial's clinicians and psychology research assistants. Assessments at 12 months were carried out by a psychology research assistant who had not been employed during the intervention period. This member of staff was blind to the homes' intervention: the trial's staff did not identify the intervention homes to the researcher and nursing home staff were asked not to discuss their homes' intervention with the researcher. Despite these efforts, because the package was designed to influence the whole care approach of staff, it is likely that the research assistant would have been able to detect which homes had received the intervention. Primary outcomes (at the cluster level) were the proportion of patients receiving neuroleptic treatment at 12 months and the mean dose of neuroleptic. Secondary outcomes were agitation, patient level quality of life, proportion of patients taking other psychotropic drugs, adverse events (including documented falls), and incidents involving irritable behaviour directed at staff or other residents. Analysis followed a prespecified plan based on an intention to treat basis; all clusters with available data were analysed in the groups to which they were allocated. With only six clusters in each group, it was not possible for us to carry out analyses at individual level, since the large sample approximations underlying these procedures are questionable.22 All primary analyses were therefore carried out at the cluster level using a weighted two sample t test, weighted by the number of patients in each home. Although the test assumes no severe departures from normality, it is remarkably robust to violations of the underlying assumptions, especially when there are equal numbers of clusters assigned to each intervention group.22 The assumptions of the test are also more likely to be satisfied if a weighted analysis is carried out. With only six clusters in each group, the Shapiro-Wilk test for normality will have low power, and a histogram may be difficult to interpret. We therefore used the non-parametric Wilcoxon signed rank test as a sensitivity analysis to test for differences between the groups. In principle, a stratified design should be accompanied by a stratified analysis, but with such a small number of clusters and two stratification variables it is unlikely that the gain in precision would outweigh the loss in degrees of freedom.23 For primary outcomes we used a weighted linear regression analysis (weighted by cluster size) as a sensitivity analysis, to adjust for the stratification factors. For the primary outcome, the proportion of patients receiving neuroleptics at 12 months, we present results for each cluster (nursing home) graphically in a bubble plot, where the size of the bubble is proportional to the size of the cluster, and for each intervention group, equivalent to the weighted mean of the cluster specific proportions for each randomised group. We express the treatment effect as the difference between the two weighted means, along with a 95% confidence interval, P value, and intracluster correlation coefficient. Subsequent analyses for the coprimary and secondary outcomes were based on the 12 cluster specific proportions for dichotomous outcomes, and the means or medians, depending on normality, for continuous outcomes. We used the weighted t test to compare the appropriate summary measures obtained for each cluster. Treatment effect sizes are expressed as the difference between the treatment groups, along with 95% confidence intervals, P values, and intracluster correlation coefficients. All analyses were carried out using Stata version 8. 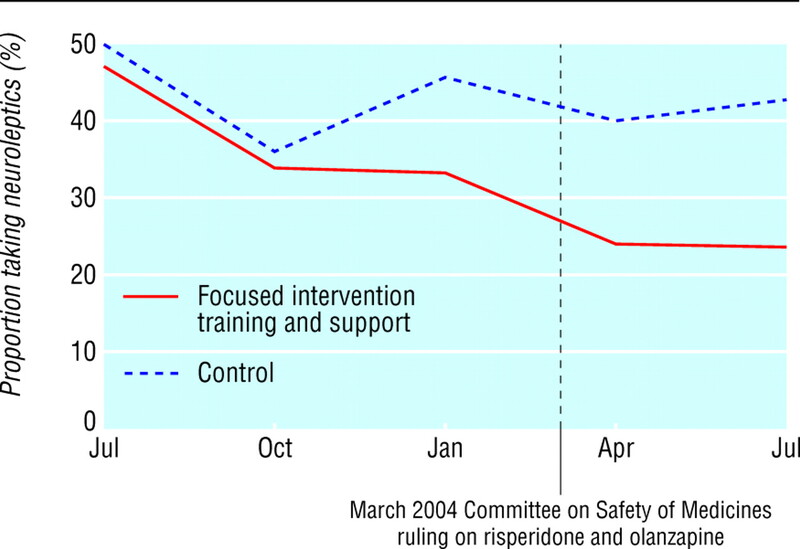 Six care homes were randomised to the training and support intervention and six to treatment as usual (control homes; fig 1). All residents, not just those present, were analysed at each time point. This did not affect the primary analyses, carried out on the follow-up data at 12 months only. Personal and clinical characteristics of the residents in both arms were similar at baseline (table 1). At 12 months' follow-up, 40 of 174 (23.0%) residents in the intervention homes were taking neuroleptics compared with 69 of 164 (42.1%) in the control homes: average reduction 19.1% (95% confidence interval 0.5% to 37.7%). With one exception, little or no overlap was found in the proportion of residents using neuroleptics in each home across the treatment groups (figs2 and 3). To examine the robustness of this result, a sensitivity analysis was carried out excluding residents with conditions that precluded the withdrawal of neuroleptics (for example, residents with a primary diagnosis of schizophrenia, bipolar disorder, or psychotic depression who are increasingly placed in nursing homes registered for dementia care). 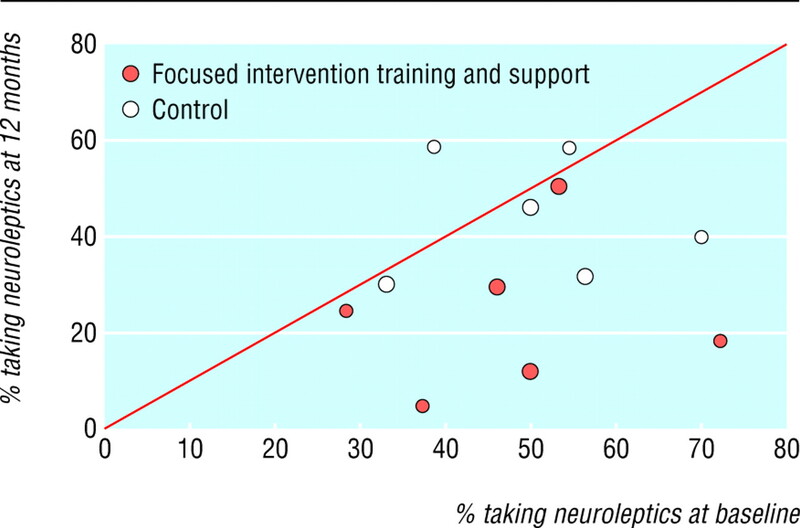 After exclusion of these residents from analysis, 28 of 161 (17.4%) residents in the intervention group were taking neuroleptics at 12 months compared with 60 of 155 (38.7%) in the control group: average reduction 21.3% (4.3% to 38.3%; P = 0.02). A further sensitivity analysis, adjusting for stratification variables (baseline neuroleptic use and region), gave an average reduction in neuroleptic use of 19.4% (−3.0% to 41.7%; P = 0.08). Data on dose of neuroleptics did not follow the normal distribution. The median was therefore the appropriate summary statistic for each cluster, and the mean of the medians between groups was compared. At 12 months the mean dose was 107.1 in the control group and 102.1 in the intervention group: average difference 4.9 (−20.0 to 29.9; P = 0.67: table 2). Adjusting for stratification variables confirmed this result (average difference 4.0, −22.0 to 29.9; P = 0.73). After excluding those residents for whom withdrawal of neuroleptics would have been contraindicated, this difference increased to 19.3 (−7.0 to 45.7; P = 0.13), with a mean dose of 114.3 in the control group and 94.9 in the intervention group. At 12 months the average proportion of residents taking other psychotropics was 109 of 174 (62.6%) in the intervention group and 92 of 162 (56.8%) in the control group: a non-significant difference (5.9%, −27.2% to 15.5%; P = 0.56) suggesting that neuroleptics were not simply replaced with other psychotropic drugs. Similar proportions of residents had at least one fall in the past 12 months—91 of 175 (52.0%) in the intervention group and 90 of 165 (54.6%) in the control group: average difference 2.6%, −18.7% to 23.8%. No significant differences were found between the intervention and control groups in levels of agitation at 12 months (mean difference 0.3, −8.3 to 8.9; P = 0.94). At least one episode of aggression was recorded for 14 of 173 (8.1%) residents in the intervention group compared with 16 of 165 (9.7%) in the control group: average difference 1.6% (−12.7% to 15.8%; P = 0.25). Ratings for wellbeing in residents in the intervention group were similar to those in the control group (1.1 v 0.9, mean difference −0.2, −0.5 to 0.2; P = 0.29). A marginal advantage was shown for the intervention group in the proportion of residents spending at least some time withdrawn during the six hour observation period (37.6% v 46.4%, average difference 8.8%, −25.2% to 42.8%; P = 0.58). The proportion of residents who spent at least some time asleep was similar between the groups: 110 of 149 (73.8%) for the intervention arm v 114 of 153 (74.5%) for the control arm. An intervention offering support with individualised psychological intervention as part of a programme promoting person centred care and good practice provides a viable alternative to neuroleptics for treating behavioural symptoms in patients with dementia. In both intervention and control homes in our study, psychiatrists reviewed the prescriptions of the residents and recommended withdrawal of neuroleptics in accordance with best clinical practice, yet significantly fewer residents in the intervention homes remained taking these drugs. The percentage of residents (after excluding those with schizophrenia or other psychotic disorders) who were still prescribed neuroleptics at the end of 12 months was less than half that in the control homes. Levels of agitation and episodes of aggressive behaviour did not increase in homes with reduced prescribing of neuroleptics. Cohen-Mansfield et al carried out a placebo controlled cross over trial of neuroleptic withdrawal in patients with dementia and found no significant worsening of behavioural symptoms when drugs were replaced with a tailored psychological intervention.8 In another study,9 89 people with dementia from a large community nursing home were randomised to receive either a complex intervention including activities, guidelines for drug use, and educational rounds, or treatment as usual. Patients who received the active intervention showed a significant improvement in behaviour and a trend towards a reduction in neuroleptic use. Failure of the training and support intervention to have a significant effect on any of the secondary outcome measures may reflect difficulties inherent in affecting the culture of care within a nursing home enabling change to be measured in such a small scale trial. In March 2004 the Committee on Safety of Medicines wrote to all doctors in the United Kingdom to advise against the prescription of risperidone and olanzapine in patients with dementia. The effect of this communication, which might have been expected to result in discontinuation of neuroleptics in a large number of participants in both arms of the trial, was only modest. 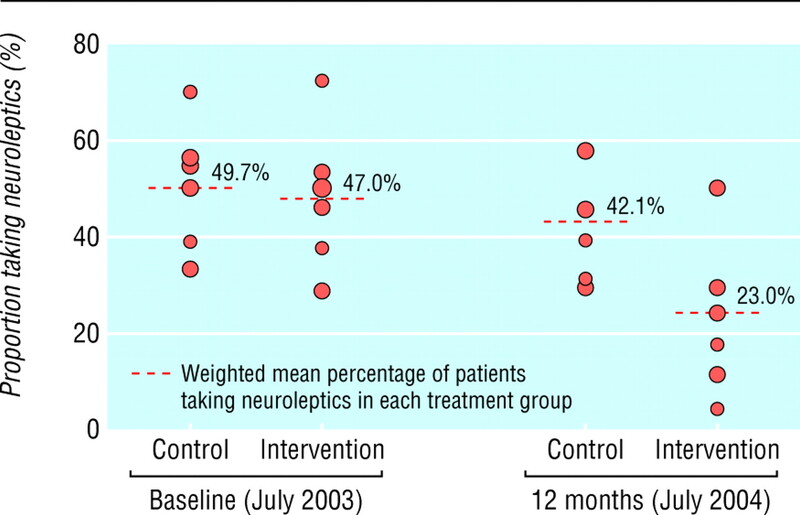 Differences in the proportion of patients receiving neuroleptics at each review (fig 4) between the groups were sustained over the year, and similarly affected by the ruling of the Committee on Safety of Medicines. The nursing homes that agreed to participate reflected a typical range of care provision for people with dementia in the United Kingdom and included three private individually owned and managed facilities, seven homes belonging to different large groups of care home providers, and two NHS managed facilities. Despite such heterogeneity between ownership and management of the homes and the geographical spread of the study, the training and support intervention was accompanied by significant reductions in the numbers of residents prescribed neuroleptics across the country. This is Version 2 of the paper. In this version, figure 2 has been amended to include all nursing homes [one was missing from the previous version]. We thank the residents and their family carers and staff of the homes. Rosamund Weatherall provided statistical support. Barbara Carlton, Brenda Barber, and Cathryn Roblett acted as consumer monitors for the Alzheimer's Society. Katrina Gasson, Karen Hathaway, and Jill Sawyer were the research clinicians. Jessica Baker, Sarah Barrett, Roland Burke, Ruth Elvish, and Sarah Wilmarsh collected data. Contributors RH, RJ, and CB conceived the study and obtained funding. All authors contributed to the study design, carrying out the study, and preparing the manuscript. EJ and NA contributed to the statistical analysis. RH is the guarantor. Funding Grant from the Alzheimer's Society, funded by the Community Fund. Competing interests CB is director of research for the Alzheimer's Society and has received payment for attending advisory boards from Janssen, AstraZeneca, and Bristol-Myers Squibb. RH has spoken at educational events sponsored by Janssen and has acted as a paid consultant for Bristol-Myers Squibb. Ethical approval Northern and Yorkshire regional multicentre research ethics committee and local committees in Oxford, Newcastle, and London.
. Survey of prescribing in residents of nursing homes in Glasgow. BMJ 1996;314: 611–2.
. Prevalence and pharmacological management of behavioural and psychological symptoms amongst dementia sufferers living in care environments. Int J Geriatr Psychiatr 2001;16: 39–44.
. A randomised trial of risperidone, placebo and haloperidol for behavioural symptoms of dementia. Neurol 1999;53: 946–55.
. Olanzapine treatment of psychotic and behavioural symptoms in patients with Alzheimer's disease in nursing care facilities: a double-blind randomised, placebo-controlled trial. Arch Gen Psychiatr 2000;57: 968–76.
. Pharmacological treatment of neuropsychiatric symptoms of dementia: a review of the evidence. JAMA 2005;293: 596–608.
. Guidelines for the management of agitation in dementia. Int J Ger Psychiatr 2001;16: 714–7.
. Quality of life for people with dementia living in residential and nursing home care: the impact of dependency, behaviour and psychotropic drugs. Int Psychogeriatr 2001;13: 93–106.
. Management of verbally disruptive behaviors in nursing home residents. J Gerontol A Biol Sci Med Sci 1997;52: M369–77.
. A randomised trial of dementia care in nursing homes. J Am Geriatr Soc 1996;44: 7–13.
. The efficacy of dementia care mapping as an audit tool: a report of a 3 year British NHS evaluation. Ageing Ment Health 1998;2: 60–70.
. Effectiveness of continuing education in long term care: a literature review. Gerontologist 2003;43: 259–71.
. Some aspects of the design and analysis of cluster randomisation trials. Appl Statist 1998;47: 95–113.
. Mental health consultation: process, professions and models. In: Smyer MA, Cohn M, Brannon D eds. Mental health consultation in nursing homes. New York: New York University Press, 1990.
. Dementia reconsidered. Buckingham: Open University Press, 1997.
. Mood and general behaviour of patients with severe dementia during one year of supervised, individualized planned care and systematic clinical supervision. Comparison with a similar control group. Aging 1999;11: 395–403.
. Teaching and maintaining behaviour management skills with nursing assistants in a nursing home. Gerontologist 1998;38: 379–84.
. A randomized controlled trial of a specific reminiscence approach to promote the well being of nursing home residents with dementia. Int Psychogeriatr 2004;16: 33–49.
. The castle and the know-it-all—access to the inner circle. J Dementia Care 2003;11: 24–6.
. The effect of challenging behaviour and staff support on the psychological wellbeing of staff working with older adults. Aging Ment Health 2000;4: 359–65.
. Agitated behaviors in the elderly. II. Preliminary results in the cognitively deteriorated. J Am Geriatr Soc 1986;34: 722–7.
. Evaluating dementia care the DCM method. 7th ed. Bradford: Bradford Dementia Research Group, Bradford University, 1997.
. Design and analysis of cluster randomised trials in health research. London: Arnold, 2000.
. 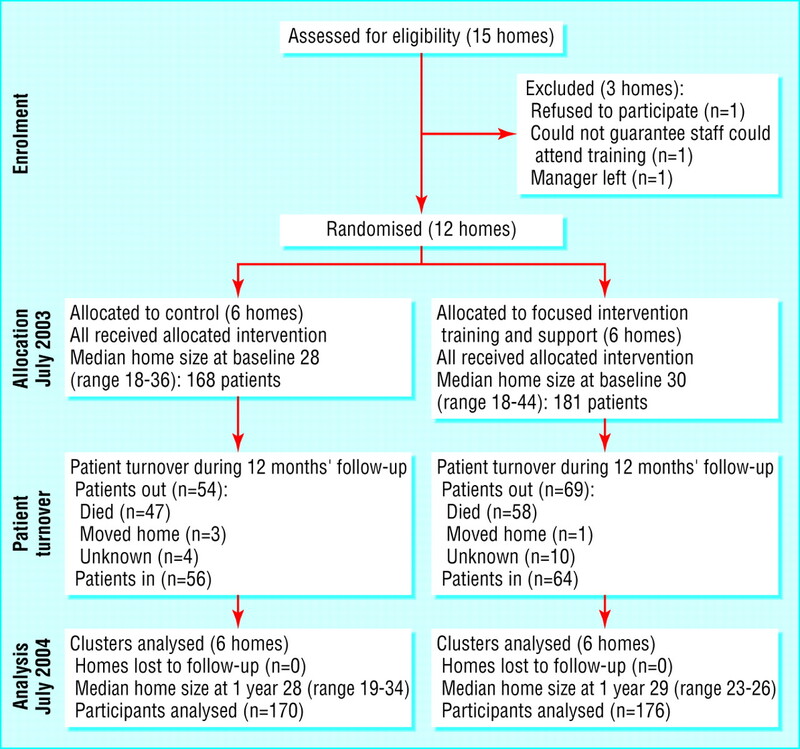 Putting theory into practice: a cluster randomised trial with a small number of clusters. Stat Med 2001;20: 341–9.